Zach Weiner is a name known by many on the Internet thanks to his online comic SMBC and several other funny and educational productions. 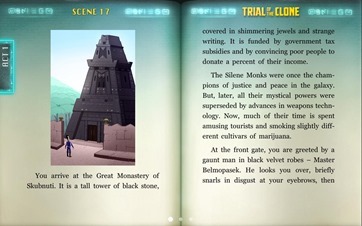 Now, he is adding an interactive gamebook to his repertoire with Trial of the Clone. First published as a paperback in October 2012, the digital project started its life on Kickstarter with a modest goal of $15,000, but had achieved an impressive sum of $130,132 by the end. 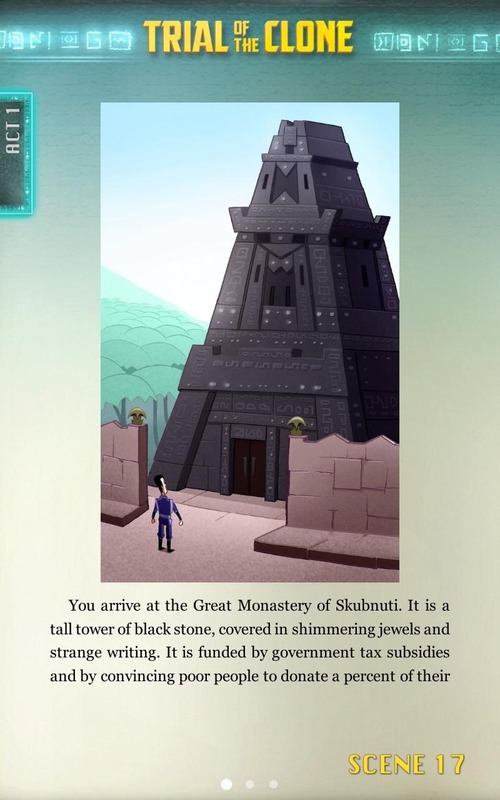 The interactive book – a sci-fi adventure comedy – is filled with parodies on classic scenes from geek favorites like Star Wars, Hitchhiker's Guide to the Galaxy, and Star Trek. One of the stretch goals of the Kickstarter project called for hiring "some geek celebrity badass" to record voiceovers to accompany the book, which brought out none other than Wil Wheaton to fill the role. Readers can have the story read aloud in the actor's voice, however, the audio is not built-in and requires an active data connection to stream it from a remote server. Illustrations have been provided by Chris Jones, who also worked with Zach on the web comics Snowflakes and Captain Stupendous. 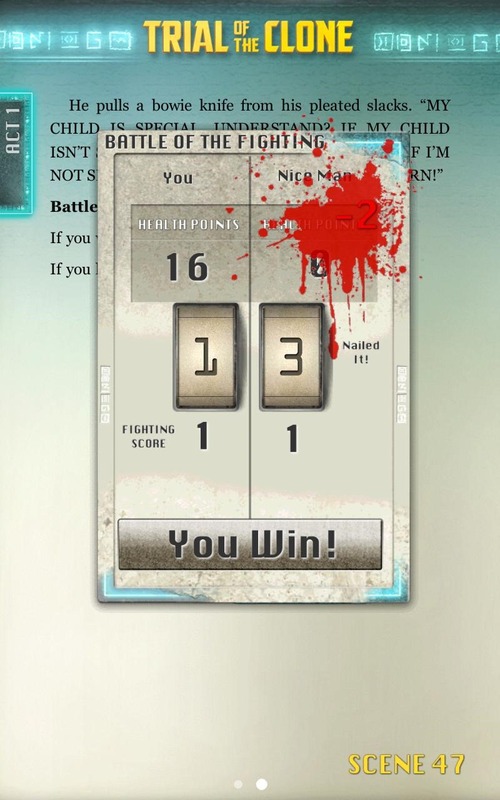 Tin Man Games provided the engine that drives this story and many other successful interactive titles, including the Gamebook Adventures series and recently released House of Hell. There are some basic gaming elements built into the experience, but readers are given a few options to cheat or manipulate some outcomes. Trial of the Clone does make frequent use of adult language and situations, falling somewhere between Family Guy and South Park, making it inappropriate for young children. If you are not familiar with Zach's many projects, now would be a good time to start checking out his work. He recently experienced a repeat success on Kickstarter with SCIENCE: Ruining Everything Since 1543, which pulled in a mind-blowing $341,667 despite an unambitious $20,000 goal. 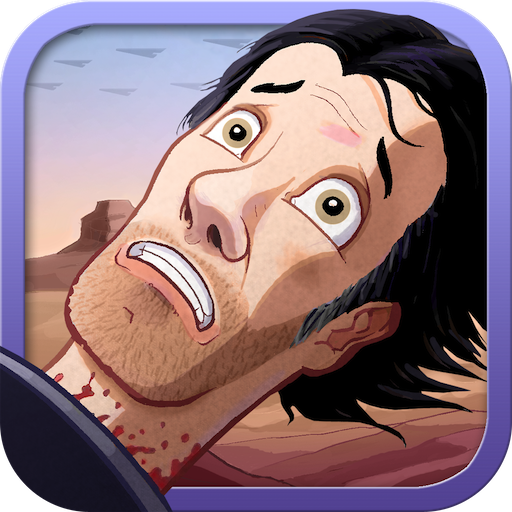 Trial of the Clone is available now for $3.99 on the Play Store.